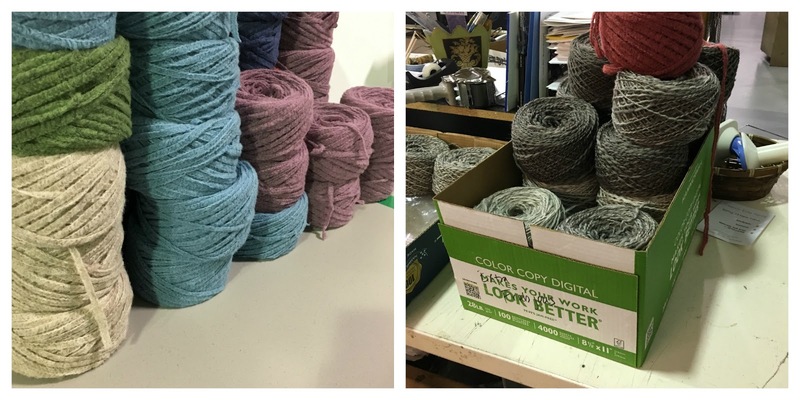 At this time of year in the yarn business, we have to think twice about what our focus is. It seems no matter how long we have been creating yarns and their corresponding designs, we still get a bit befuddled this time of year. That’s because our new “spring” yarns and patterns are out and available to you at your LYS (go check them out!). And while we are still talking about spring, we are in the throes of getting the sales force ready to show the new fall line to your local yarn store. One of the most important jobs is making little hanks of yarn (“mini-skeins”). 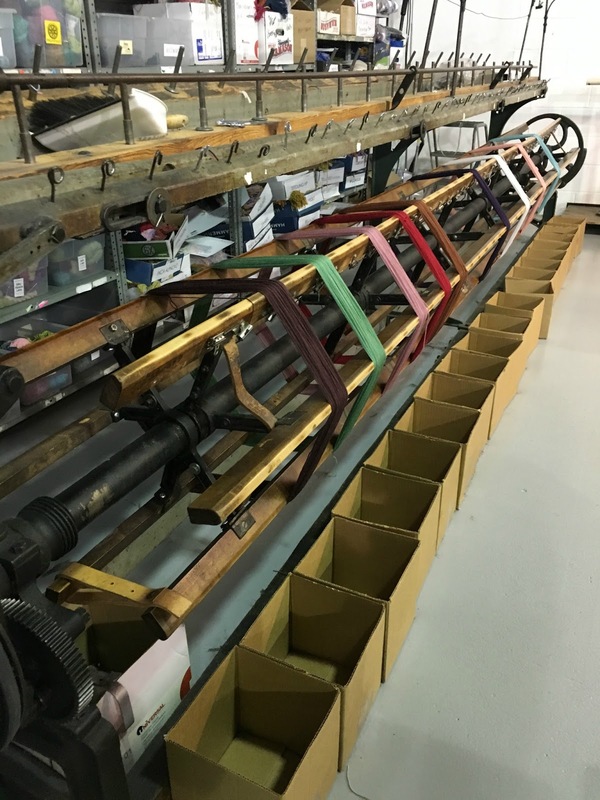 To make these, we use an antique reeler, one that has been with the company longer than nearly all of its employees. 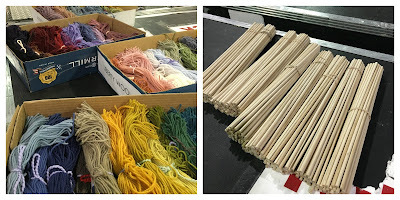 We make thousands of mini skeins which are then used by your LYS when they make their decisions; we also take them to trade shows and use them at CEY Yarn Tastings hosted by shops and guilds all over the country. The sales reps also show the shops every color of each and every yarn – that’s a lot of colors! The yarns are cut into strands that are looped onto skewers. Once all the yarns are looped on, the skewer gets glued to a large printed “board” and trimmed. Since the “presentation boards” show all the current colors in a particular quality of yarn, it makes it easy (or not so easy!) for shop owners to choose the best palette of colors to stock their shelves. We are also madly finishing up photoshoots, stroking knitting lots of sample swatches of each new yarn, selecting and cropping photography, and fondling labeling samples. All for fall which is still many months away. Sometimes you find a pattern you just love, but not always the color choices that go along with it. So you ponder if you should go with the yarn it calls for and settle for a color that might not totally speak to you, or prepare yourself to make some tweaks if you choose to make a substitution. We are in love with Fortuna, the newest addition to our spring collection of yarns. 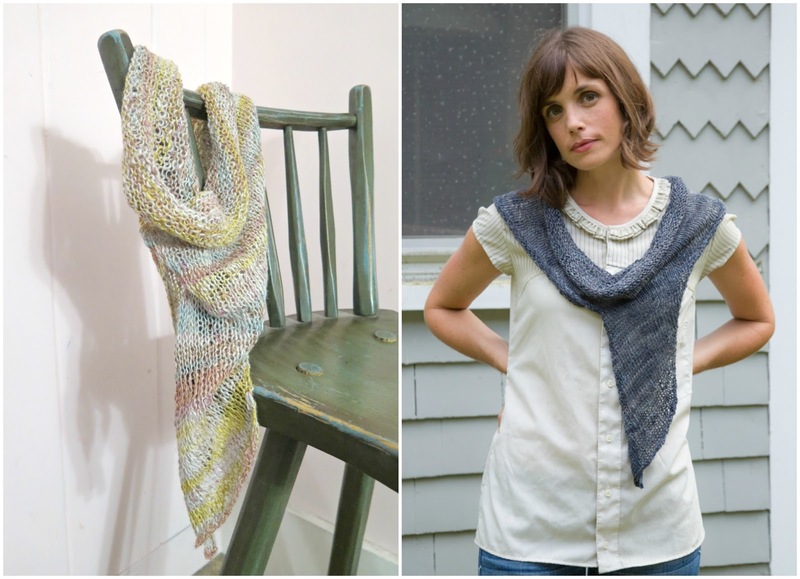 And while we always have new patterns to support a new yarn, there are only so many our design team can produce. The good news is that new Fortuna and a seasonal favorite, Bella Lino, are interchangeable! 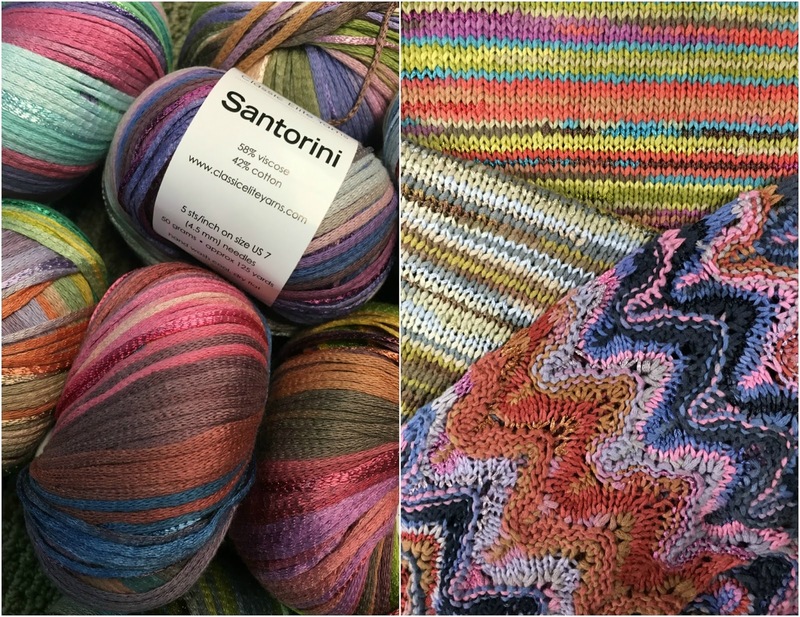 Dyed on the same yarn base, Fortuna is available in 10 rich tone-on-tone colors while Bella Lino has 13 striping colorways in just the right balance of bright and muted color combinations for summer. 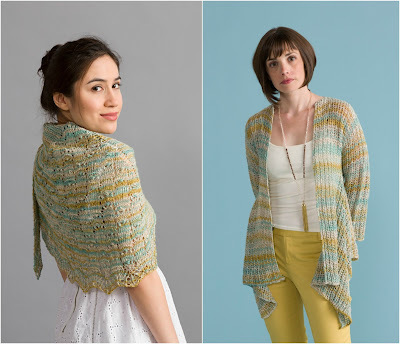 That means there are a lot of summer-ready designs to choose from for both of these yarns. Frankie is a cute ruffled tank top that would also be beautiful in any of the Bella Lino colors. Or consider adding an extra bit of color and interest by combining the two in Francine? You could make the border accents with both Fortuna and Bella Lino or choose Bella Lino as the main color and combine the softer tones of Fortuna as the accents. Two other Bella Lino favorites are Wavelength and Stand by Me. These pieces would be equally beautiful in Fortuna. You get the idea – the two yarns can be swapped, combined, mixed matched – there are all sorts of possibilities! We can’t wait to see what you make! Can you tell? We can’t wait for spring to arrive. So we decided to release two patterns early! 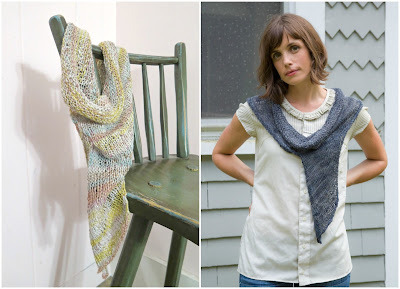 Both are from the upcoming book Highland Summer and are now available on Ravelry. Una is an elegant, all occasion cardigan to welcome the warmer weather. It’s made in Sandpiper, where 8 plies of multi-dyed strands are twisted together to create colorways with depth and interest. This is the perfect project to start now to be ready for the warmer weather ahead. 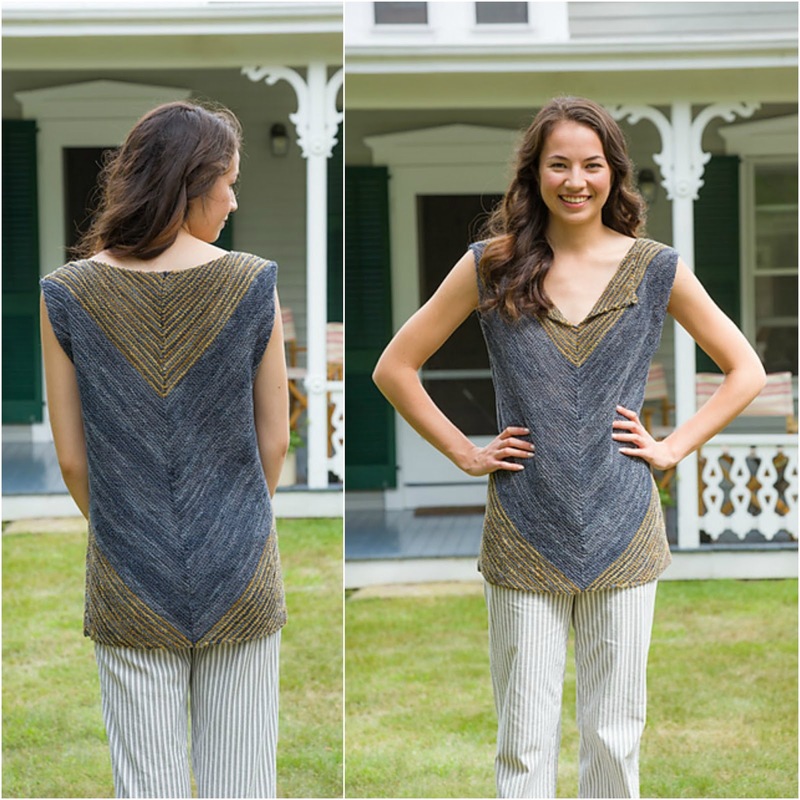 Bonnie is a fun-to-knit pattern worked in Silky Alpaca Lace, with an easy to remember stitch pattern. What a stunning piece to wear! And notice the fringe? A win-win! Fringe is totally on trend and makes for no ends to weave in. 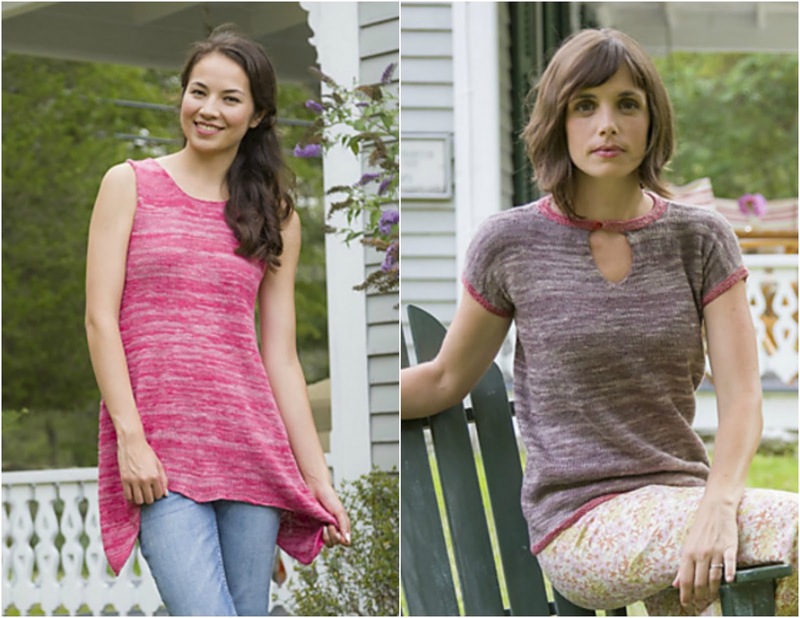 Just for fun, and because we love spring, leave us a comment, telling us which of these patterns you'd like to knit, and we'll choose a winner. Be sure to leave your Ravelry username or another way for us to contact you. 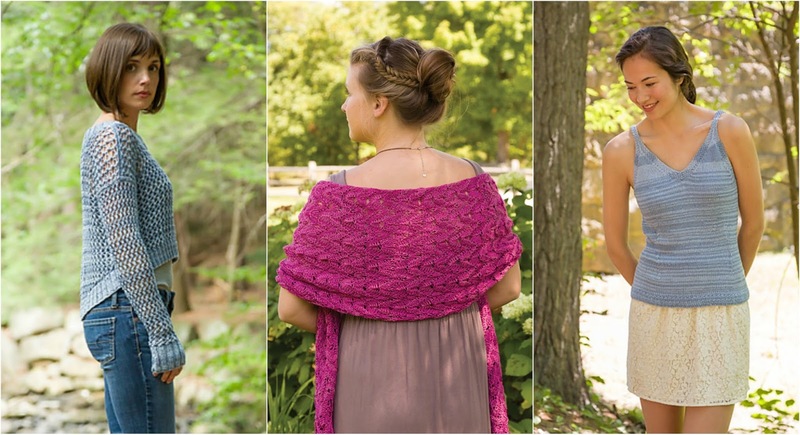 We'll send the winner (selected randomly) a link valid for any one free CEY pattern! The deadline to enter is Sunday, March 13th, at 2:00am eastern time – which is exactly when we change the clocks to Daylight Savings Time on the east coast – a sure sign that spring is just around the corner. So while it's still too early to really go outside and dig in the dirt, know that spring is on the way and cast on one of these beautiful pieces! Not wanting to jinx it, but we’ve been pretty lucky here in the northeast in regards to the weather this winter. There wasn’t much snow to dig out from and the temperatures overall have been relatively mild. Still, who doesn’t look forward to the arrival of spring when our surroundings begin to pop back into color letting us know that warmer weather is just around the corner? A harbinger that we won’t need to be all bundled up and will be able to wear lighter fabrics in cheerful bright colors. So as the world around us starts to wake up and all the browns and greys become the background for the tender green shoots and trees bursting with buds we think of two of our favorite summertime yarns. 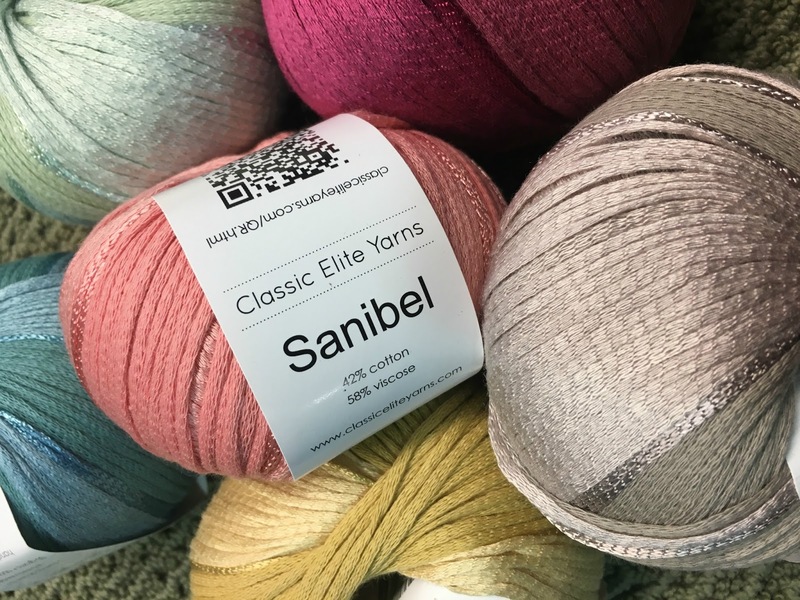 Sanibel and Santorini are two fabulous yarns that are interchangeable. With lovely, soft drape and intermittent bits of shine, these two yarns are fun to work with and wear. Sanibel is the more subtle of the two and with silky tone on tone colors that makes any design become simply elegant. Santorini is the more outspoken of the two with multiple colors creating stripes in beautiful combinations. 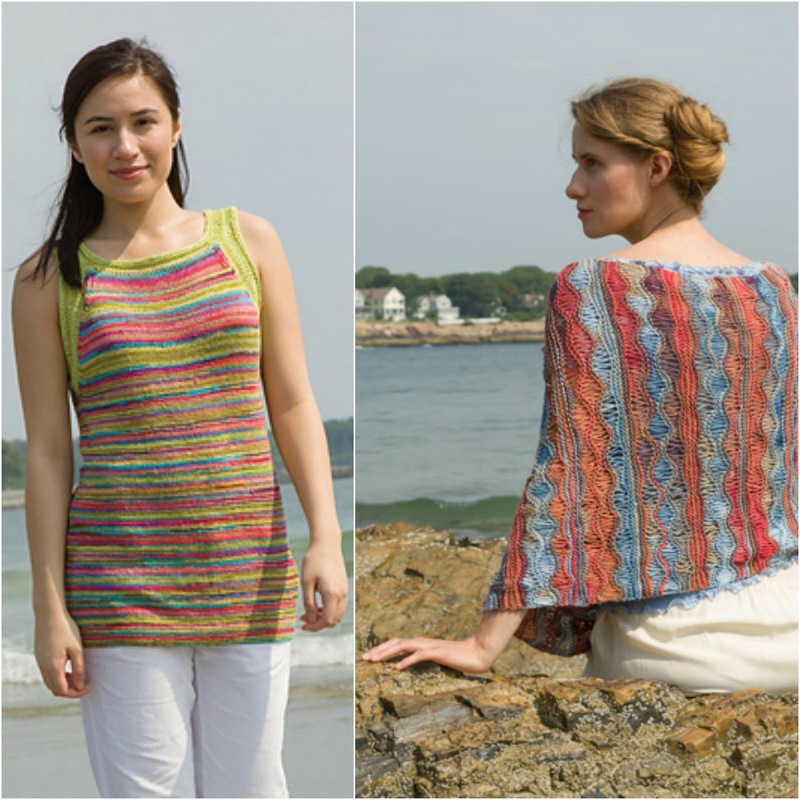 Choose to make the vibrant Nashawena top, or wrap yourself up in color with Naushon, a fun piece to knit and wear. It just seems that when the world is soon to be in bloom around you, fun, bright pops of color are the way to go!